Pioneers of American Freedom: Origin of Liberal and Radical Thought in America is a book by the German anarcho-syndicalist Rudolf Rocker about the history of liberal, libertarian, and anarchist thought in the United States. 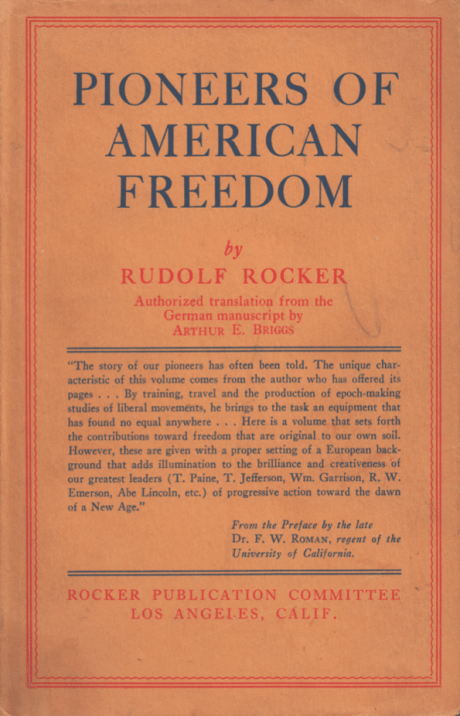 Rudolf Rocker, who had been strongly influenced by Benjamin Tucker, started work on Pioneers of American Freedom during World War II. Professor Arthur E. Briggs started translating the book into English from Rocker’s native German in 1941. He took over for Rocker’s previous English translator Ray E. Chase as he had died. The book was published with the help of the Rocker Publishing Committee in 1949. Ho ho ho! It’s Will Ricciardella in a Trump hat, come to make America great again just in time for Christmas. Is Trump a fascist? Is there really any difference between fascism and socialism?